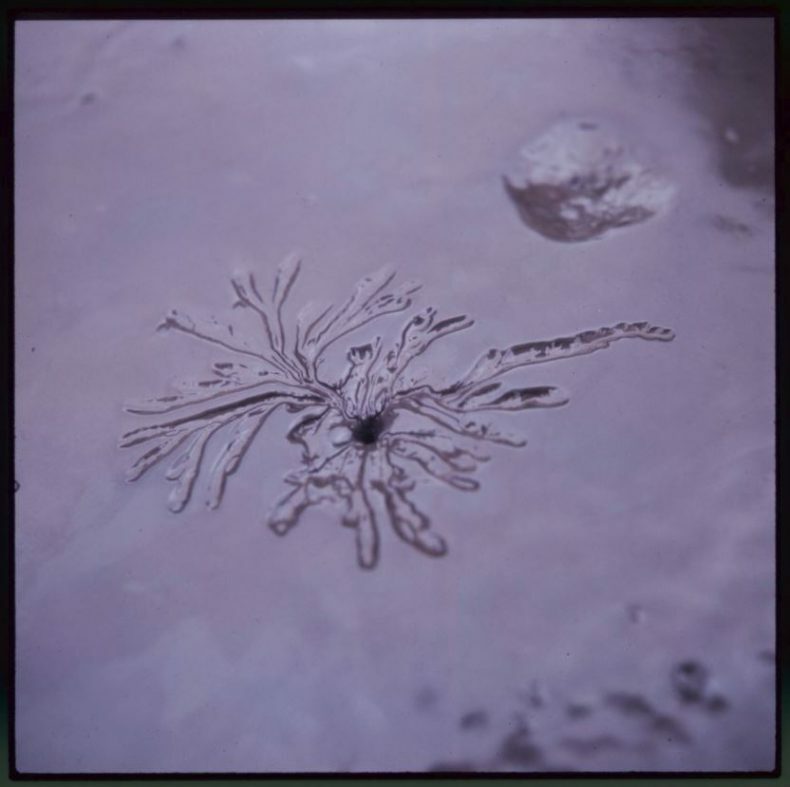 Last year, a four-year project to digitise nearly 1,500 Theo Schoon photographs of bubbling mud and thermal landscapes came to an end. Thanks to the hard work of Image Coordinator Lucy Jackson and Archivist Jennifer Twist all of these images can now be viewed on Collections Online. Jennifer and Lucy share some details of this monumental project and how they found a fondness for mud. 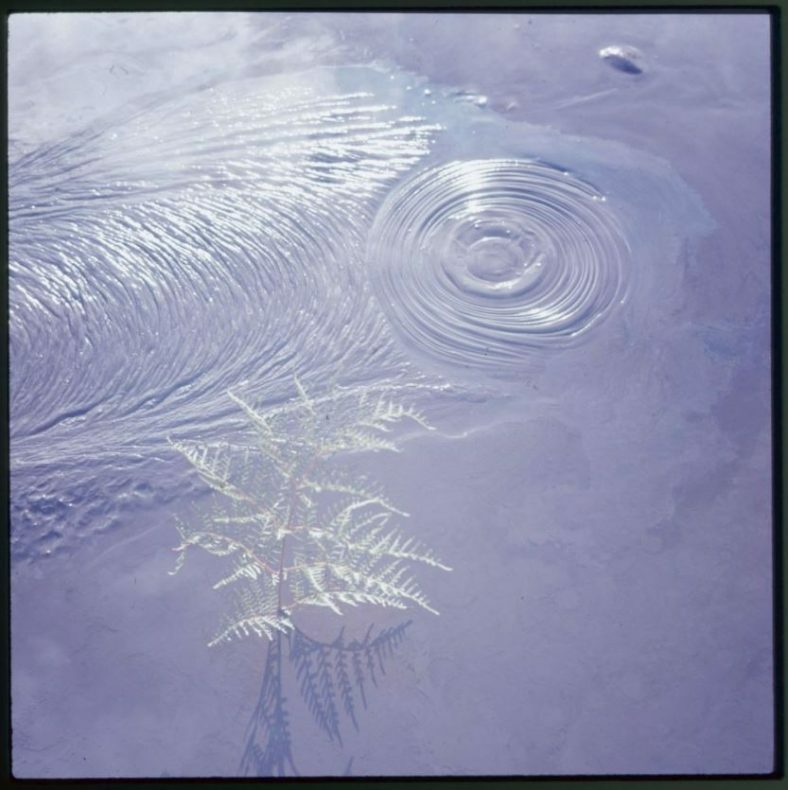 Jennifer: I’ve always loved the solitude and natural beauty of Theo Schoon’s geothermal photographs. I suppose it’s the isolation of the areas he visited and the moments in time he captured. 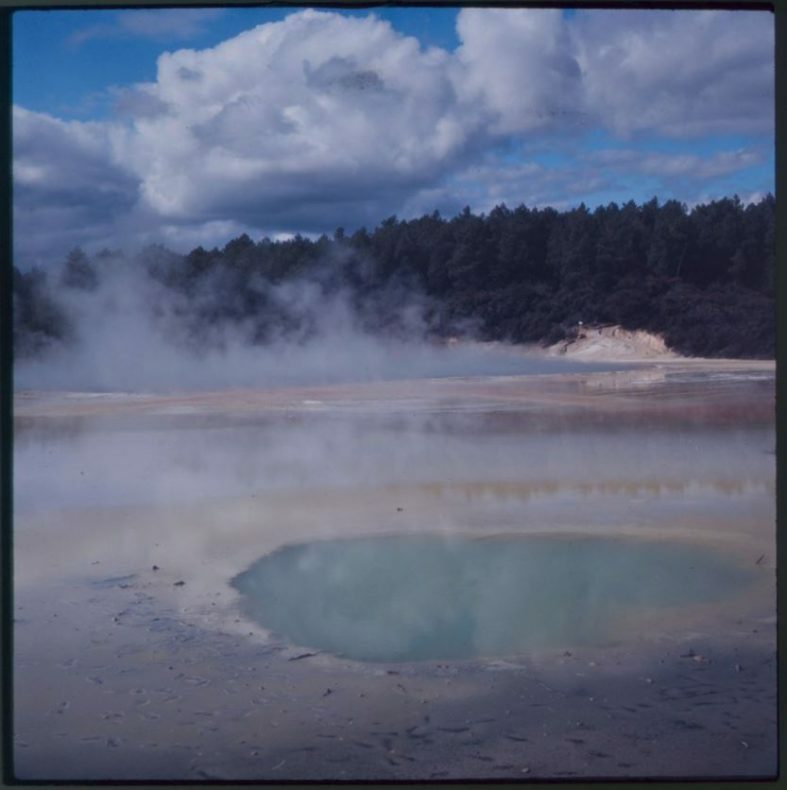 Theo Schoon moved to Rotorua in 1950 and while working in forestry gangs around Rotorua he spent his free time photographing the geothermal formations, at Taupō, Wai-O-Tapu, and Whakarewarewa. 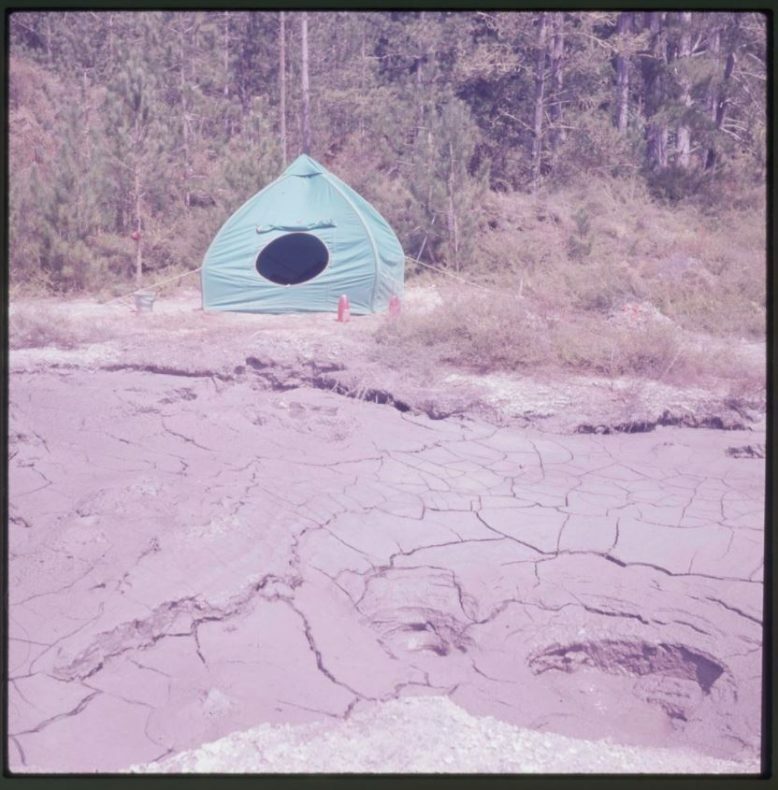 Schoon would pitch his tent in inaccessible areas and for five years he explored and photographed the thermal activity of these areas. 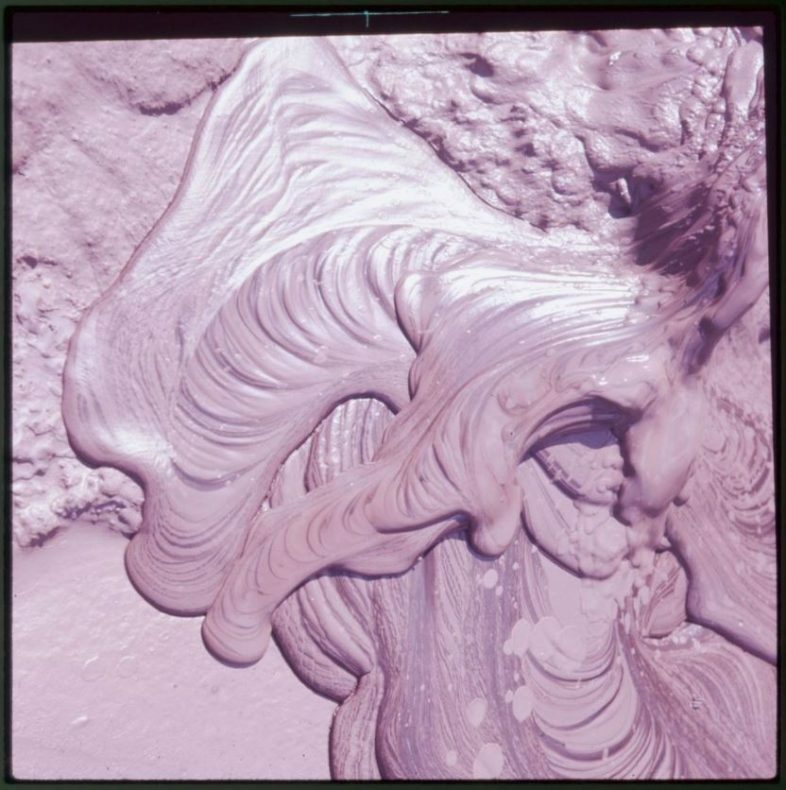 Schoon moved to Auckland in 1956, but later in 1965 he returned to Rotorua to continue photographing mud pools and geothermal activity. To get a better image Schoon would often give Mother Nature ‘a hand’ by manipulating the outcome of the desired thermal activity. 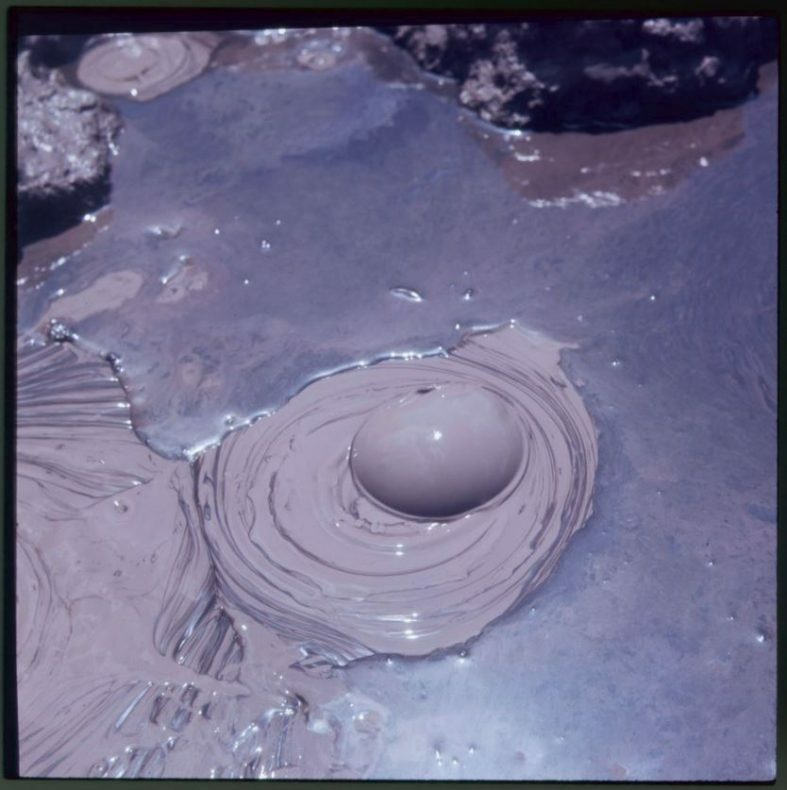 Contamination of this kind is now illegal as it has adverse effects on local hydrology and severely disrupts the natural ecosystem in the mud pools. Jennifer: For some time I’d been aware that due to the age of Theo Schoon’s photographs they were susceptible to colour fade. It was therefore integral that work began digitising and preserving these objects. It took me three years to catalogue a total of 1,462 new records. I would then deliver them in batches to Lucy, who would scan and upload the digital images to our collections database. Lucy: When I started this project I was a little disengaged. 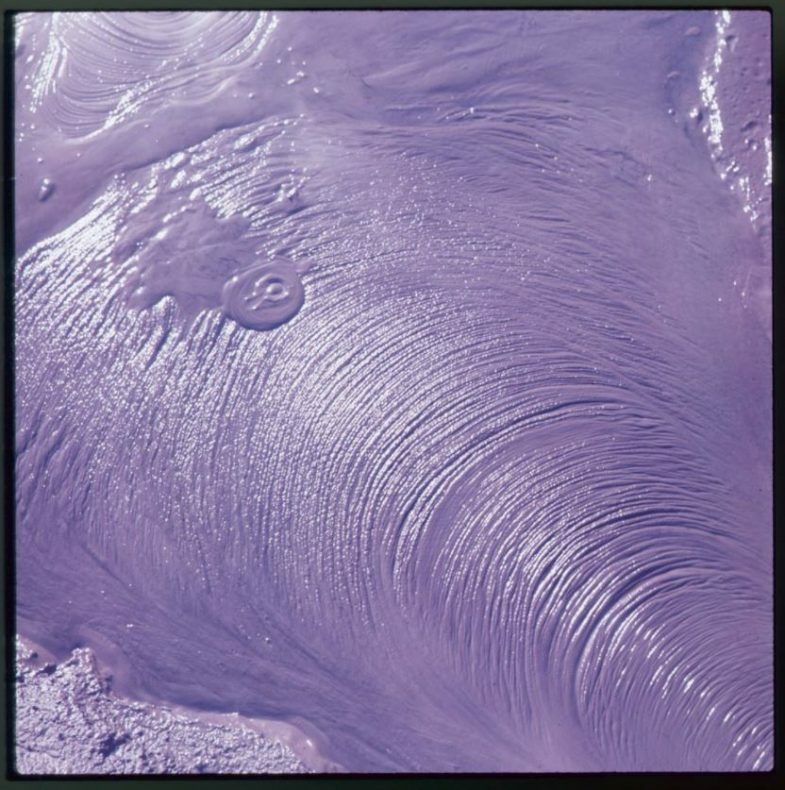 I knew nothing about the artist who created them, nothing about the archive, and was confused as to why we were scanning 1,500 images of what I thought, at first, were just rock or mud pools. But my mindset soon changed. Lucy: As time went on I started to feel a sense of serenity and affinity with these rock and mud pools, every one of them was different, even if it was minimal. I was impressed by the dedication Schoon had to photograph something that most people didn’t admire, or if they did, it was as a tourist, or spectator, rather than being committed to exploring the differences in aesthetic depending on light, climate, or change in time. 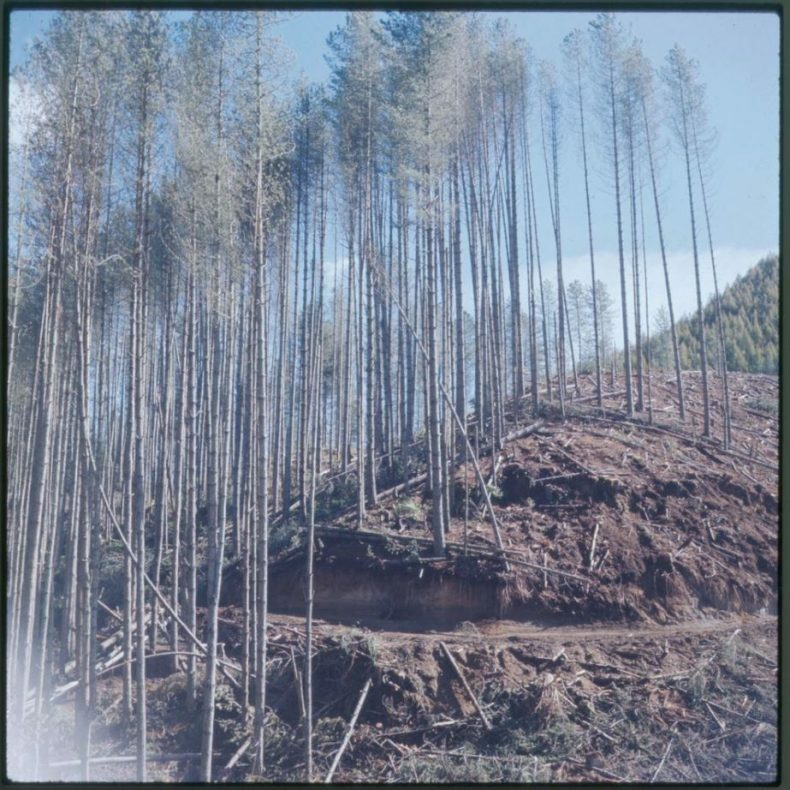 Scanning the slides enabled me to see not only the documentation of a natural phenomenon, but the patterns, colours, shapes, and form that can be seen in them and extrapolated from them. In these, I began to see an influence of art of the time – a preoccupation with the non-figurative and the modern through nature. 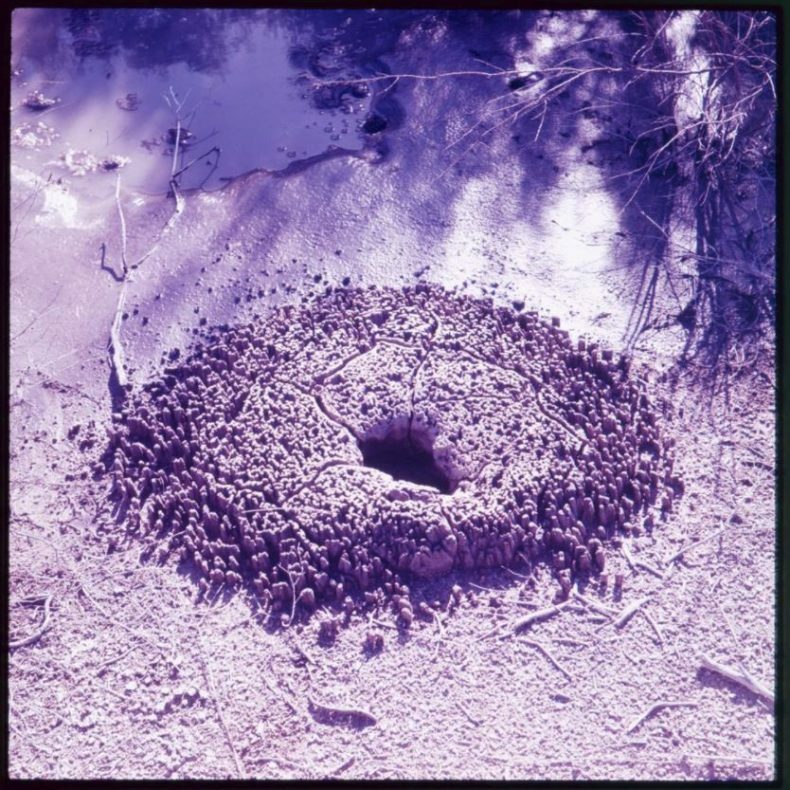 Lucy: My first highlight was when I scanned the first image that wasn’t of a mud pool. I had scanned the batch of slides and opened them up on my computer. Much to my surprise, one of the images was of a branch sticking out of some mud. It doesn’t sound like much, but after scanning so many photographs of a similar nature I was intrigued as to why Schoon had changed his routine. Another highlight was when I opened an image which had not only a rock pool, but a foot in a jandal caught in the corner – presumably Schoon’s! These small surprises kept the project going, I didn’t know when I would come across something different – whether that was a person, a foot, a branch, a leaf. These seemed like little spontaneities between the larger documentation of rock and mud pools that were so crucial to Schoon’s practice. I could almost imagine being Schoon, photographing a rock pool, waiting for its formation to change and then out of the corner of his eye seeing a branch or leaf that just had to be captured alongside everything else. Jennifer: Theo Schoon considered each of his photographic images as individual art works. While it may be true that there has been a colour shift due to film dye fading in Schoon’s original photographs I believe the digital reproductions do justice to Schoon’s work. Now, over 60 years since the photographs were taken, I think perhaps Schoon would have appreciated our efforts to preserve, digitise, and make these images available online for others to appreciate the beauty of these works. You can see a selection of Theo Schoon’s geothermal photographs in the new exhibition Détour by Michael Parekowhai. While I agree that the photo collection is a highly valuable resource, and can admire Schoon’s dedication and skill in amassing it, and Te Papa’s excellent effort in making it available, I have to point out that pouring a contaminant such as detergent into a natural geothermal feature, without resource consent from the relevant Regional Council would now be considered an offence liable to prosecution. As well as the adverse effect on local hydrology from the introduction of excess water and surfactant, there would be a devastating effect on the thermophilic microbial ecosystem of the mud pool. Each pool has its unique biota consisting of thousands of species of microorganisms that colonise the mud in proportions dependent on the complex chemistry of that particular pool. Far from ‘giving nature a hand’ this represents downright breath-takingly irresponsible vandalism. 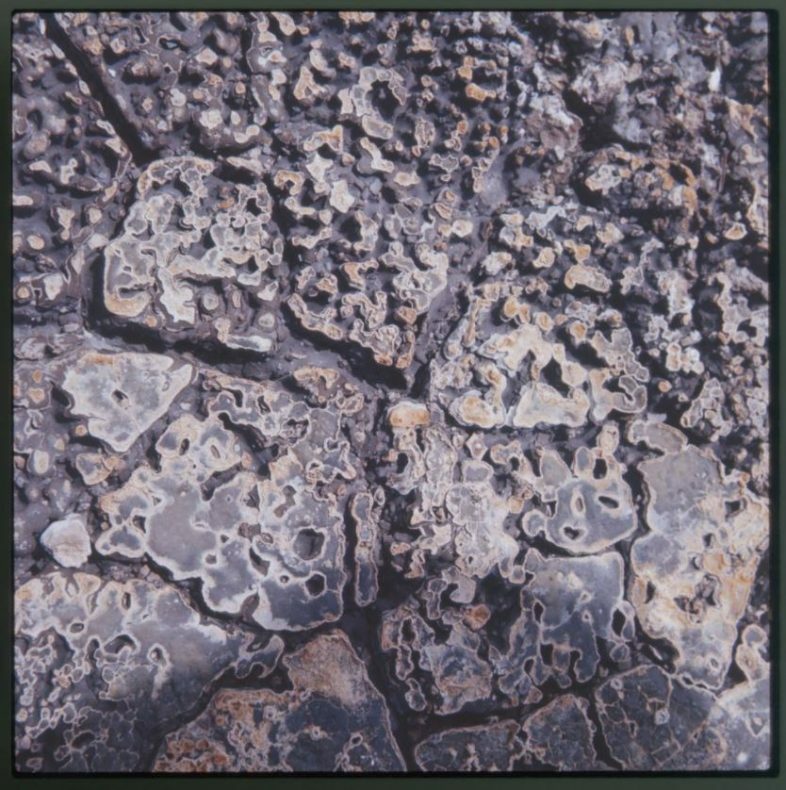 Since mud pool generally have no liquid discharge route, the contaminant would remain indefinitely. The Waikato and Bay of Plenty Regional Councils, which contain 90% of the nation’s geothermal resource, have rules that prohibit this sort of activity, and prosecutions have been undertaken for discharge to geothermal features. I would appreciate it if you could contact me at the given email address so we can discuss potentially editing the post to either point out that this sort of contaminant discharge is now illegal, or to remove reference to the discharge altogether, as retaining it in it current form, in my opinion, could imply that the activity is acceptable and potentially encourage others to do the same. It’s super to see these Jen and Lucy – thank you! Well done Jennifer and Lucy a great personal insight into a digitisation project. Surfacing this material for public consumption is an invaluable piece of work that has already proven to be very successful. Kia ora Mike, thank you! Thank you so much for doing this massive project. It highlights so well a fascinating side of Theo Schoon’s work – a side I wasn’t really aware of, and a side that needs more exposure! Thanks Carol. I totally agree! Thank you Carol, yes it was a big project, but well worth it! Glad you enjoyed. 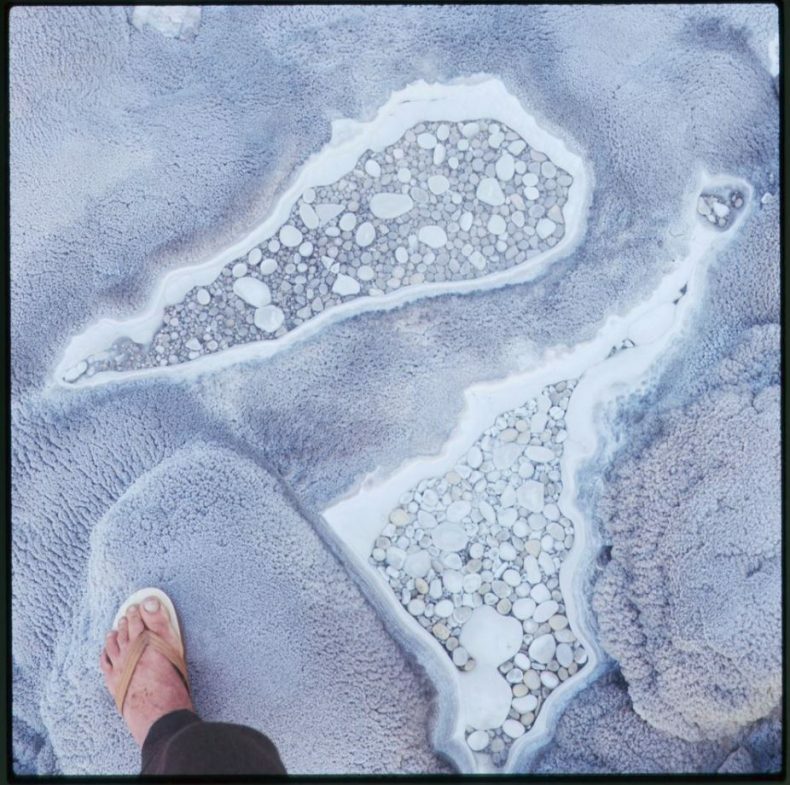 Being from Rotorua I really enjoyed reading your blog and particularly seeing the gorgeous array of forms and colours in Theo Schoon’s photographs. Images of mudpools and steam (along with manuka) evoke memories and brings on an attack of homesickness. Thank you for your kind words and sharing your memories of Rotorua with us. It was a great project to work on and I’m looking forward to the next time I visit Rotorua where I will probably experience it through a more Schoon-like lens! Morena Chrissy, glad you enjoyed!